JB Morin is a man on a mission – to unravel the science and discover the practices behind what best makes athletes sprint faster. He has amassed an incredible team of researchers who are equally as interested in advancing speed training science and methodology. I urge athletes and coaches to read through this interview carefully, as the information is cutting edge and highly insightful. Hi JB (follow JB on Twitter HERE), thanks for agreeing to do another interview. Your LAST INTERVIEW was very well received in the strength coaching and track & field communities. You’ve been very busy, and your BRAND NEW PAPER is getting some great attention. But let’s back up a bit. Over the past several years, your lab has published some incredible research on sprint mechanics. Why should we care about sprinting forces – how can it help us improve upon our training methods? Thanks Bret, it’s always a pleasure to share views and research conclusions with you and your followers. Initially, the labs and collaborators involved in these studies were performed by the research group at the University of Saint-Etienne on the sprint instrumented treadmill, but then we extended and basically confirmed our results in the recent paper using track embedded force plates at the French National Institute of Sports INSEP. Even though I personally moved to a new position at the University of Nice, our multi-center research group still has projects under review, and in preparation. As to your question, our approach is considering the overall mechanical output of the neuro-musculo-tendinous system and the resulting forces applied onto the ground to propel the center of mass (CoM), and in turn the entire body. So in this “dynamics” context, ground reaction forces (GRF) in relation to subjects’ body mass are the main determinants of the motion of the athlete’s body, and in turn of his sprint performance. This is a “macroscopic” approach in that we only measure and study the overall output of the system, i.e. the magnitude of resultant GRF produced, and the orientation of its application, from its horizontal, vertical and lateral components. So here is one limit of this approach in terms of training, it tells us how much force is produced and how effectively it is oriented onto the ground but it does not go into further details as to the muscles involved, their respective contributions to the total (resultant) GRF, and their timing of activation (coordination). Still, these two “basic” elements: magnitude of GRF and orientation of the GRF vector are very interesting from a training perspective to quantify both the muscular capabilities of the sprinter, and the effectiveness of GRF application. I usually refer to “technique” for the latter concept, but it is also a matter of muscle action. The main training challenges now are to find out how to best train this ability. As your readers know, training science has gone into much detail as to how to increase the lower limbs’ “total” force, now the idea is to increase the athlete’s ability to apply this force with effectiveness. Our aim in this series of studies was to investigate what mechanical factors differ between non-specialists, good and world-class sprinters during their acceleration. Now our challenge (ours and coaches’) is to investigate and test the best solutions to develop these factors through practice. Training implies time, money, sometimes pressure for performance, and risk of injury, so you want to know what to work on and how. I am excited for future research to emerge elucidating the best methods for improving the horizontal orientation of GRF production. Now I ask you to please discuss the pros and cons of your previous lab’s methods. Our previous methods were based on having the subjects sprint on a motorized treadmill that accurately and instantaneously responds to the subjects’ motor actions. Every Newton of propulsive or braking ground reaction force was associated with an acceleration or a deceleration of the device. To see this in detail, watch this video. The obvious limit of this device is that subjects do not sprint overground, and a serious familiarization session is needed before undertaking any sound measurements. Furthermore, the top speed reached and the overall sprint performance is around 20% lower than what subjects could typically do on the field. However, we showed in a 2011 paper that treadmill and field performances were correlated and the fastest sprinters on the treadmill were also the fastest sprinters on the track, and thus inter-individual comparisons were possible. For the pros, first and foremost, this device allows measurement of the three components of the GRF, at the sampling rate of 1000 Hz, and for any type of duration (for instance we simulated 400-m efforts for a fatigue study, or repeated sprints in another one). It is totally safe, and even highly skilled sprinters told us that the acceleration feeling was very close to what they experienced on the track. So it’s virtually like having a force plate under the feet for the entire sprint. In addition, this device allows athletes to perform a typical acceleration phase (from zero to high speed), which was hitherto not possible with other devices on which subjects typically had to drop themselves onto the fast rolling belt. Last, the motor torque is adjustable so we can do resisted or assisted sprints (data in process). Only 2 motorized treadmills of this kind exist in the world; one is at the Laboratory of Exercise Physiology at the University of Saint-Etienne in France, and the other one is at ASPETAR Sports Medicine Hospital in Doha, Qatar. Sounds like the pros of using the motorized treadmill for research far outweigh the cons. To your knowledge, how many published studies on sprinting forces (or impulse or power) to date examine elite sprinters? My favorite sport science picture. Archibald Hill during field sprint measurements. By the way, Hill and others showed the exponential decay of sprint velocity as a function of time in papers from 1927 and 1928 (see below). Of the published papers that currently examine sprinting forces (or impulse or power) what is the major drawback of every single one of the papers? Studying sprint mechanics is a “pick your poison” game: either researchers like Peter Weyand or our group used instrumented force treadmill and studied treadmill sprinting rather than overground sprinting, or researchers used force plates and studied “real” sprinting mechanics, but over a very limited number of steps (typically 1 or 2). The treadmill modality allows you to measure GRF continuously but either at realistic top speeds only (Weyand’s studies) or the entire acceleration phase but until top speeds that are lower than reality (our studies). 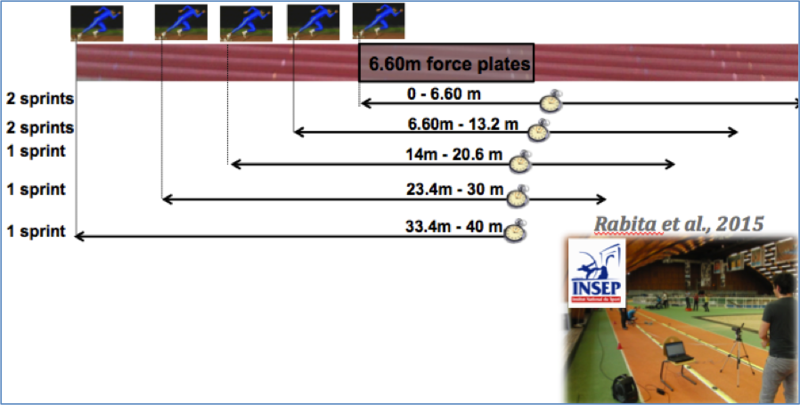 The main drawback of the force-plate approach is that you get accurate but really narrow “pictures” of the sprinting mechanics, since you have data measured over one or two steps in the blocks, at 8, 12, 25 or 40-m of the sprint. It does not allow you to have a broad knowledge of the GRF production over the entire performance, and there is a risk that the data you collect do not represent the entire sprint. Well put JB. When I was in New Zealand at AUT University, I told my supervisor John Cronin that we should have built an entire 100 meter track lined with force plates embedded into the ground. I don’t think it would be that hard to do, and it would have allowed for some incredible research. There currently aren’t any Universities to my knowledge that have anything like this. What was your solution to overcome this problem? Should money and logistics allow you to build it, this kind of track is possible, however, empowering the plates, setting filters, gains in the signals, time-synchronizing the different plates, digitizing the data and eventually getting smooth and treatable GRF data will be a huge challenge. In our recent paper, the INSEP engineer, Antoine Couturier, had a really hard time getting final data for us to process and study, and the force plate setting in Paris is only about 7-m long! In fact, Figure 1 in our recent paper (see image below) is one of the most impressive Figures I’ve ever inserted in a publication, and there were many hours of work behind these data. Vertical, horizontal, and lateral GRF traces over time and the corresponding positions of the force-plate system. So it might take a little while until longer installations than the currently existing 10-m to 15-m force plate systems are available for human performance research. 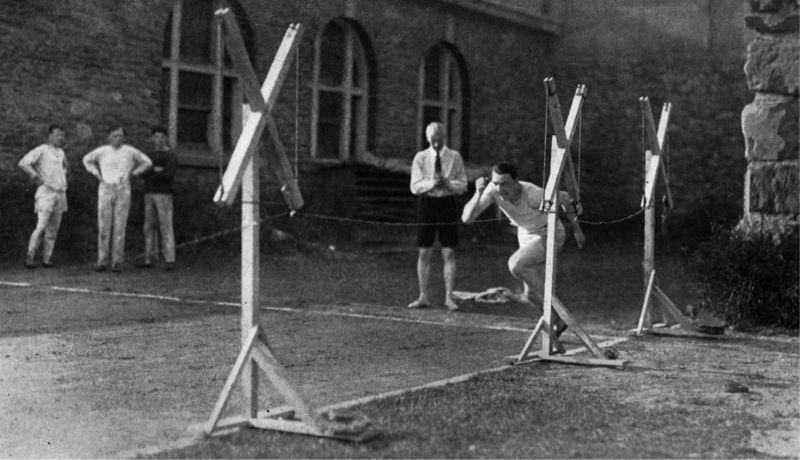 But at the time of Hill’s research on sprint running in the 1920’s they used magnets and coils along the track, so we can definitely anticipate that such instrumented tracks will exist in the future. In our most recent study, we virtually re-constructed a complete 40-m by having athletes perform several 10, 15, 20, 30 and 40-m sprints, and placing the starting blocks at various distances from the force plates, so that we collected data for almost all the steps of a 40-m sprint in each of the subjects. Because these highly skilled sprinters have very reproducible kinetic and kinematic patterns, we assume that, should this have been possible, the data collected over a continuous 40-m measurement would not have been different from those we present here. Schematic representation of the protocol, by Pierre Samozino. This is a great step up from previous research! Does this mean it’s perfect? Perfection does not exist in science, and we always struggle to limit drawbacks and biases, and use the “least worst” solution, method, design, device, etc. Sometimes it is frustrating, but my view is that when nothing better exists, you must do with what’s available to you, and just be conscious of the limits floating above your results and conclusions. Refutability and debate is the basis of the scientific game, and what is accepted as true now will be adjusted/refuted/confirmed in the future. You have to be humble and accept the inherent limitations of the current methods, and try to put sound knowledge forward. Otherwise, you just stay at your desk waiting for perfection. This is for sure easier as there is no risk of having to say, “we were wrong”, but it is unproductive and hopeless. Amen JB! Let’s talk about what we learned from this latest research. Please discuss the relationship with stride rate and stride frequency throughout the entire 40 meter sprint. 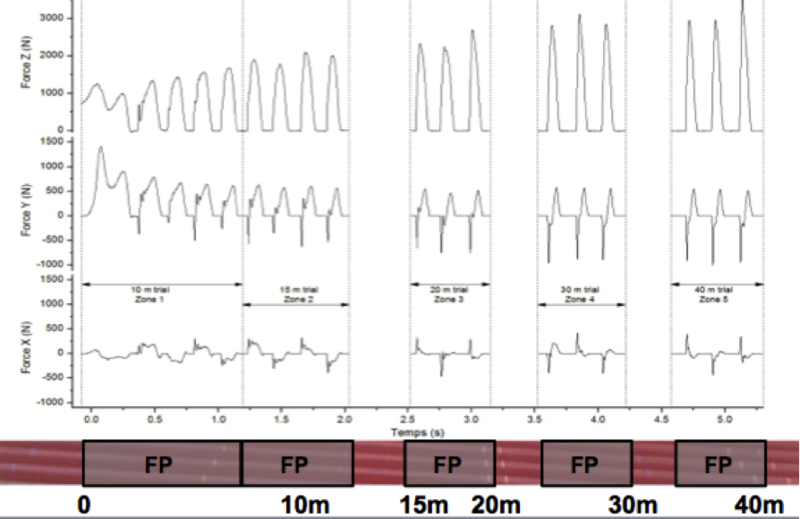 Our results show that while step length increases regularly over the acceleration phase (from the blocks push-off to the 40-m line), step frequency is almost instantaneously leveled at the maximal value athletes can reach: 80% at the first step and about 90% after the third step, and then remained constant thereafter. This is basically what Sofie Debaere et al. also reported in 2013: high-level sprinters develop in the 0-to-10-m phase a step frequency higher than 95% of the step frequency they reach at maximal speed. As a consequence, the speed increase of high-level athletes is afterwards quasi-exclusively caused by the increase in step length. Fascinating! Do faster sprinters produce more total force into the ground in the blocks and during the 40 meter sprint, or is vertical or horizontal force more important? What about the ratio of forces? In the blocks, elite sprinters produce much more (about 25% more) horizontal force and power than less skilled sprinters. When averaging data from all the steps of the 40-m sprints after the blocks push-off, we observe that faster sprinters produce 10% higher horizontal force (Effect Size of 1.75). Contrastingly, they produce less vertical force (2% on average, Effect Size of 0.59). Note that our comparison is based on the data of 4 elite sprinters (best 100-m times ranging from 9.95 to 10.29) and 5 sub-elite sprinters (10.4 to 10.6 s). Sorry we could not recruit more athletes of the same level to perform more detailed stats than just % difference and Effect Size analyses. Ratio of force data (the “ratio of force” in our approach is the ratio, for each contact phase, of the horizontal component to the resultant GRF) show that elite athletes are more efficient both in the blocks (+13%, ES of 1.46) and on average over the 40-m (+10%, ES of 2.31). In other words, since elite sprinters produce around 10% more horizontal force and around 2% less vertical force than their sub-elite counterparts, their ratio of horizontal to total force ends up being around 13% greater. Does this validate your previous findings using the sprint treadmill? Overall, yes, clearly. The horizontal force production during the acceleration is significantly and highly related to field sprint performance, whereas the vertical and resultant GRF production are not. This is better expressed through the paramount importance of the “ratio of force”, and in summary, the fastest sprinters at the end of the acceleration phase are not those who produce the highest amounts of total force with their lower limbs, but those who orient their push the most effectively, and in turn produce the highest horizontal force. In both our treadmill and overground studies, acceleration and 40-m or 100-m performances are significantly and highly correlated to the average horizontal force produced per unit body mass, and not to the average vertical force produced. Note that the vertical force produced per unit of body mass was only related to the value of top speed reached, as previously observed by Weyand et al. Our new study supports the fact that the importance of horizontal versus vertical force production to sprint performance basically depends on what phase of the sprint you are interested in: whole acceleration versus top-speed phase only. However, even in top speed sprinting, horizontal force is critical. If we look at Figure 1 from the study (shown above), we see that throughout the 40 meter sprint, vertical force rises and horizontal propulsive force diminishes. Many track & field specialists infer this to mean that vertical force is more important than horizontal force. Why is this outlook unacceptable? Yes, this is true if you look at the force peak only, but what is really important is to look at impulses (i.e. force-time integral). The vertical impulse increases and the horizontal net impulse decrease over the acceleration, respectively because the CoM height increases from the starting-blocks to the classical running position and because as you know (muscle’s force-velocity relationship), our bodies can’t help producing lower and lower amounts of force as moving velocity increases. We recently submitted a study focusing specifically on impulses in which the vertical impulse per unit body mass is not correlated to 40-m performance, whereas horizontal net impulse is. So definitely, to accelerate in the early phase of a sprint (typically a 20 or a 40-m sprint), what is a key determinant is the amount of net horizontal, not vertical impulse you produce. So although speed and vertical impulse increase concomitantly over the acceleration, the amount of speed produced (i.e. sprint performance) is not correlated to the amount of vertical impulse produced. That said, our data (treadmill and track) clearly and consistently show that only the average vertical force produced AT TOP SPEED is well correlated to the amount of top speed reached, and not to the amount of acceleration produced beforehand. So maybe here is the main confusion made, you should not extrapolate what is important for top speed running only to what is important for acceleration. Our paper, currently in review, shows that vertical impulse tends to be negatively related to 40-m acceleration performance in very high-level sprinters (when its influence on performance is tested independently from that of the horizontal impulse, by means or multiple regression analyses). Many coaches (such as myself) seem more interested in maximum speed sprint mechanics. 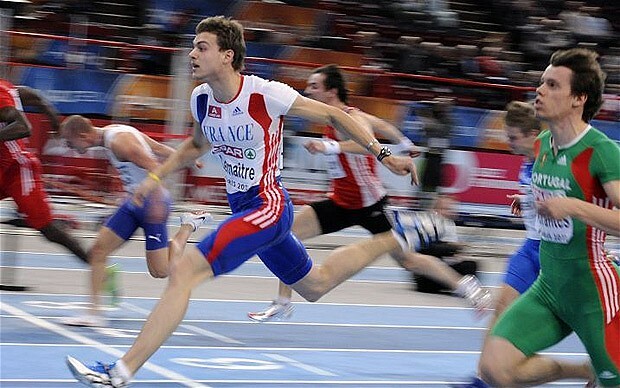 Why should we be more interested in acceleration sprint mechanics for sports? To me this is paradoxical, if you look at the descriptive time-motion data published in various sports, you see that in fact, only in track and field 100 and 200-m is top speed running a key factor. In all other sports where sprinting is a major physical ability (soccer, football, rugby, etc. ), only much shorter distances represent most of the demands of the game, and very rarely do players actually reach their individual top speed. A simple reason for this is that in order to run at your top speed, you need an acceleration of 30 to 50-m depending on your level, in a straight line, with no opposition (tackle, change of direction, etc.). This almost never happens, and when it does, it occurs in situations that are not key situations for a defensive or offensive action. Take a rugby player (except maybe in Rugby 7s) who is able to slalom between defenders and sprint towards the try line, the decisive action will be his ability to accelerate and change direction over the first 5-20-m, afterwards, his top speed (once again, reached after 30 to 50-m) might not be a determinant anymore. Last, studies show that in soccer or rugby, most sprints and decisive sprints are shorter than 20 or even 10-m, so no top speed is involved here – just “top acceleration” capability. So to me, if you list all sports involving sprinting and sub-list only those involving pure top speed (reached after a complete acceleration) versus those involving maximal acceleration over distances too short to allow players to reach top speed, there might be only 100-m and 200-m events concerned versus a plethora of other sports. Not to mention that if you think, from a training perspective, about the number of athletes concerned in the world (i.e. 100/200-m sprinters versus all the other sports), then top speed capability might be considered as a really minor capability compared to shorter distances acceleration capability. Take the famous NFL combine 40-yard dash. It is clearly an acceleration test. Even if in fine, a high acceleration on the field will result in a high running speed, the typical constraints of the rugby, soccer, and football codes do not often allow players enough time and space to reach their absolute maximal speed. From the tenths of sprint acceleration files we’ve processed in elite athletes and soccer and rugby (all codes) players, I think 90% of all players reach their top speed between 30 and 40-m. However, we observed that in young players (below 18), top speed is reached before 30-m. So these might be exceptions to the aforementioned general observation. Some authors observed very short distances to reach top speed in college football players, during specific short sprint tests, but we may wonder whether this top speed could have been actually higher in a longer sprint acceleration context. This is the difference between the “absolute” top speed of an athlete or a team sport player and his “top speed” in the context of the shorter-than-necessary distances that the demands of his sport allow (see discussion here). So when talking about “top speed” in sports, we should definitely clarify between absolute top speed and top speed in a specific sport context. Last, even though some acceleration sprints are “flying start” sprints, the durations still rarely allow players to reach their absolute top speeds. Nota: for numerous and detailed references in all the above-mentioned sports, look for “time-motion analysis” or “physical demands” of these sports in PubMed. I see that you were also able to calculate horizontal power overground. How did you pull this off? Previously we needed a specialized treadmill in order to enable us to do this? Yes, one of our recent aims was to propose and validate a field method to get horizontal net force, and mechanical power output in sprinting from either time-distance (photocells split times) or time-speed (radar or laser) measurements. The idea was to allow many more coaches, scientists and athletes to assess and monitor the mechanical power, force-velocity profile and even effectiveness of force application (ratio of forces), and use these variables in their practice (training load, follow-ups, effects of fatigue, etc.). The theoretical basis of this simple method, first authored by Pierre Samozino, is that when humans (whatever their level) accelerate from null to maximal speed, the change in speed over time superbly follows an exponential decay. So we fit the speed-time curve with this simple exponential function, and then derivate the speed-time curve to get the acceleration-time curve. Then, using the laws of motion in the forward direction and estimating the air friction on the runner from body mass, height, wind speed and air temperature and pressure, we obtain the net horizontal force output, and when multiplying by speed (since power equals force times velocity), we obtain the mechanical power output produced in the horizontal direction. The validation was made by comparing our computations to the force plate data we’ve mentioned earlier, and basically, it works very well. The validation results were first presented in an abstract at the International Society of Biomechanics in Brazil in 2013, and the full paper is currently under review. Many coaches in various sports currently use this approach, in collaboration with us, and we’ve already published a couple of studies about soccer players acceleration versus top speed performance, hamstring injuries and how injured players differ in their mechanical output from non-injured players, at the return to sport and after 2 months of full practice, and a comparison between elite players from different rugby codes. For a detailed explanation, see this video of a workshop I did at Auckland University of Technology SPRINZ institute in 2013 (second part, sprint force-velocity-power profile). This is incredible! Thanks JB. Moving on, horizontal power was the most highly correlated marker of maximum sprint speed and 40 meter performance in your study. Do we know how to best increase horizontal power in training? What are your ideas? I think that for historical reasons (use of weights and weightlifting for S&C) and for obvious mechanical reasons (gravity and loads apply a vertical constraint), it has been overall easier to work on vertical than horizontal power development. And if I agree that there might be a transfer between gains in vertical power through training and gains in horizontal power, I am convinced it is the case in lower level and heterogeneous populations, but not above a certain level. In collaboration with researchers Matt Brughelli (see an interview with Matt HERE) and Pedro Jimenez-Reyes, we recently collected a ton of data in various sports and for levels ranging from leisure to world-class, and our first results (paper writing in process) show that jumping power in elite rugby players for instance is not correlated at all to sprint power as we measure it with our method. I like to illustrate this by the “toothpaste tube” theory: when the toothpaste tube is full (low skill level), no matter how you press the tube (no matter how you train) you’ll get some toothpaste (performance improvements). So any kind of force training might result in sprint performance gains. But after a certain skill level, when the toothpaste is almost empty (very narrow margins for improvement), you’ll have to press the tube with very specific and well-designed gestures. In a sprint acceleration training context, this might relate to the horizontal force training, when vertical force does not transfer to sprint performance anymore. 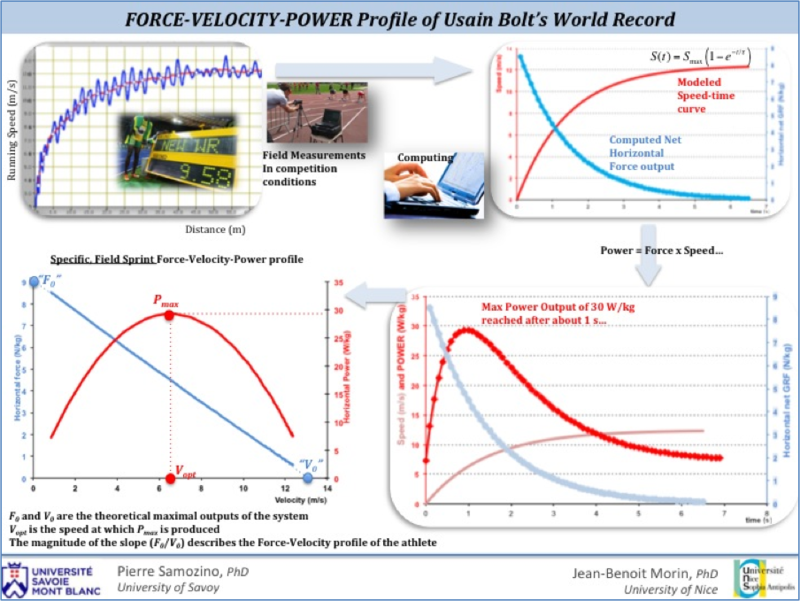 So I really think there is an interest in specifically targeting horizontal force and power development to train for sprint acceleration – especially with highly skilled athletes. One of the best ways is probably resisted sprinting using sled and additional loads, or elastic bands, or uphill sprinting. As to sled training, some studies recently confirmed the higher effectiveness of high loads compared to low loads. Kawamori showed that heavy load sled training resulted in a higher sprint acceleration performance, not because more resultant force was applied after training, but because heavy loads led subjects to push with more effectiveness and apply similar amounts of resultant GRF, but with a more horizontal orientation (and thus higher horizontal component of the GRF and in turn forward acceleration). So the key is in coaches’ hands, I think they should systematically think about finding exercises and training modalities that stimulate the forward push, in addition to or instead of the vertical push, whenever possible. I concur! Thanks again JB, one last question. Do you have any other interesting research in the works? Yep, our main current project is a one-season follow-up of tenths of well-trained athletes, soccer, rugby players’ force-velocity and power profiles in sprinting, using our simple radar method. Our focus is to seek whether power output and force-velocity profile in sprinting (or an unexpected change in these variables) is related to a higher risk of injury, and could be an objective variable to focus on in the prevention, rehabilitation and return to sport process. Other projects are in the works about the role of hip extensors in the horizontal GRF production, the so-called “transfer” between vertical and horizontal power (now that we can assess the latter precisely and specifically in sprinting), and the best training methods to develop this horizontal power output in many sports such as athletics, rugby or soccer. So I guess we’ll have new and exciting things to share for the next interview. However have you ever considered that GRF can be the result of your body (CoM) falling forward? So the better the sprinter is able to (free) fall forward the higher the GRF? Are you aware of any scientific studies that confirm that you use GRF to propel CoM forward and not the other way around where the acceleration of CoM (forward) through falling is what create the GRF? What comes first – maximal horizontal acceleration or maximal GRF? I am not an expert but no one never think about sprinting as falling. Everybody seems to be concerned about muscle efforts. When I watch Usain Bolt I see a sprinter that very good at falling forward rather than using his muscles to propel him forward! Oh yes, we all know where this “falling” is coming from: POSE and other alternative ideologies of running. Yes, we might discuss forward lean, but the big, big misconception of many people talking about “falling” in running is: YOU DONT GET FREE ENERGY BY “FALLING”. If you could, you wouldve invented a perpetuum mobile and changed the laws of physics. No, instead it goes like this: If you “fall”, that means you let gravity overcome your resistance to pull the COM closer to the earth (or exactly to the COM of both the Earth and you). Ofc its not free, you trade potential energy for kinectic energy. But what happens if u have “fallen” once? You cant fall another time, because you will soon end up having your COM at the ground. So you have to reestablish the former position of the COM: you reverse the action by trading kinetic energy to get potential energy. And how do you do that? By vertical muscle action. So Usain Bolt isnt better at falling, hes better at propelling himself forward. In short, there is no secret of “falling” in running. Just running technique and ordinary physics. Which are researched extraordinarily by the featured interviewee. A great article to a great research! I am well aware that you don’t get free energy by falling. When you are falling (or rotate around point of support) your COM moves both forward and down. Then you have to catch yourself by taking a step and then you regain your starting position. Of course this is not free at all. And yes you use vertical muscle action. My question is not about this. When most people talk about GRF they assume it is a directly propulsive force moving your body forward. Your “muscle action” is used to generate GRF that moves your body in a horizontal direction. I don’t know the answer but isn’t it possible that the GRF you measure is coming from accelerating your COM forward (and down) by falling/rotation around point of support? And the better you are at falling the higher GRF? So you don’t (have to) push-off in order to create GRF in order to move forward. Your can move forward by falling and then use “muscular action” to absorb the landing and regain your starting position? I am a POSE method coach but I also have a science degree in exercise science. I am not saying that POSE method is right at all (because I don’t know) but I am trying to “think out of the box” in order to understand how we move forward in running. I think this blog post was a good time to bring up this question and get some feedback and answers from top coaches like you and Bret. Ole, the way my mind visualizes sprint biomechanics is to envision muscle forces that created joint torques that produce ground reaction forces. For example, the hamstrings will contract to produce hip extension and knee flexion torque, both of which will produce horizontal propulsive force. But the study I linked earlier by Huang et al. showed that four different torques (active muscle torque, passive motion dependent torque, ground reaction torque, and gravitational torques) combine to create net joint torque. Since muscle actions, passive motion, ground reaction forces, and gravity all act on the joints, they all contribute to what the muscles will have to do in order to perform a certain movement task. But to address your concern more specifically, I believe that leaning forward is efficient for acceleration not due to “falling forward” but instead because it 1) makes better use of the hip extensors by giving them a better moment arm with regards to producing horizontal GRF, and 2) causes muscles normally better suited for creating vertical force to produce horizontal force due to the lean, such as the quadriceps and plantarflexors. I could be wrong about this; it’s my hypothesis. Initially and in order to start moving forward you have to destruct you balance by leaning forward. And when you run you have a slightly lean forward in order to keep falling for every step you take. The extensors paradox show that the hip extensors are not-firing when you expect to have a push-off. Contact time is less than 0.1 sec, which means you have even less time to “push-off” Are you able to do this? Wouldn’t it be much “easier” just to fall? Most people use GRF to argument that you use your muscles to push-off the the ground to move forward. But is it not possible that it is you moving (accelerating) forward by falling / COM rotating around point of support that produce the GRF you measure on a force plate (newtons third law)? All right, then I misinterpreted and assumed wrongly that you adhere to that myth – sorry. Thanks Bret for the scientific papers. The thing is, even “leaning forward” to fall isnt free: because in order to lean forward, you need a) starting to lean forward by pushing, b) maintaining that trunc forward lean by isometric muscle contractions – like in a squat, deadlift etc and c) the reestablishment of the former COM if you let it come down, as you mentioned. So leaning forward sure has some benefits as in the Kugler paper – but it isnt passive “falling”. Still, it may be a good cue to generate a forward lean. If it makes sense in the first place to keep a pronounced forward lean permanently even after the acceleration phase, as some Pose or Chi adherents wish – I leave that to the experts. I agree Chris. It’s definitely not “free,” and I think it’s related to neuromuscular power in that attaining a greater lean requires a much more powerful system to hold the position and propel the body properly. So in summary don’t have your athletes bound down the track (produce excessive vertical force) rather have them sprint down the track. I remember my track coach telling me this in the early 2000s and he did so without the use of force plates radar lasers etc. I guess it is the fate of science to always lag behind direct experience. Training to increase speed to me simply comes down to who can turn on and turn off maximally and repeatedly. That is, who can produce the greatest force in the correct position for the time allowed for the given event whether they are sprinting, cycling, boxing, rowing, jumping, whatever. If we train this one aspect we tend to get what we want in terms of increased performance. Rebound movements, force absorption (ie altitude drops) and overspeed movements either via external assistance or by using lighter loads than used in sport facilitate this nicely. If science always lagged behind “direct experience”, you wouldnt type those swell words in your computer (and I wouldnt make fun of that thought 🙂 ) but we would still sit in the Middle Ages, burn witches because they bring the Plague and the sun would still revolve around the earth, because thats what my “direct experience”/common sense/everybody´s opinion tells me when I look at the sky at sunrise and sunset. Only because some things which can be trialed and errored in the first place happen to be confirmed by science later on wont get you your vaccinations, your heart pills and your GPS system. Respectfully I think you missed my point. It was not that science is not needed valued or necessary for progress only that all science is based first in observation. It is not done in a vacuum or a prori. For that reason we should value our direct experience. Validate it through repeated experience and then theorize through rigorous science. People have discovered vauable insights about training, life, ecology years before, some times decades before science has substantiated them. Should we ignore these these because they have not be quantified and proven through rigorous science? And thats what your post was about: regretting that science comes so late in just validating things, like just giving the certificate of something we all know to be true. Well, your coach couldve been very well wrong – as other coaches were with maybe even a higher reputation than yours or the millions of people, knowledgeable, intelligent people in the sun-earth-topic: You only know for quite sure whats true or false after science has happened. I guess we have to agree to disagree. I trust my experiences. If I waited for science to validate them I would never make any progress. Futhermore science is by its nature limited as it tends to consider only one or at most a few variables at any given time, thus it is easy to miss the forest for the trees. Science often draws conclusions that are only true within certain well defined criteria. When conditions change, read when any one variable changes these scientific truths are often found wanting. The world is full of infinite variables that are always changing. That is why I trust the self changing supercomputer in my head. It takes in billions of variables everyday and produces predictable responses. That is not to say it is infallible or that science has no value because it does. It is only to state that we have this great organ of pattern recognition and we should use it and not wait for science to validate all of our actions and decisions before we make them. Getting way off topic but enjoyed the discussion. Your brain is a fascinating and at the same time very bad supercomputer for these things. It simply wasnt made for researching complex topics with probabilities, its was made for survival. I highly recommend the bestseller book “Thinking, fast and slow” by Nobel Prize winner Daniel Kahneman. After that – or any other read concerning the topic – you wont think of yourself and your abilities the same. Also, science can handle multiple factors very well, mathematically-statistically with modern computing technology and by the whole approach: It usually concentrates on a few to reduce complexity and steadily build up knowleadge in order to then put together the pieces. But you could of course just make a very realistic, very complex scientific study – you would get a direct, highly applicable result free from those mentioned personal pitfalls and cognitive biases. For example: “Which training is best for maximal sprinting for people like me?” You just wouldnt be able to explain the “whys”, the mechanisms, afterwards. But its certainly doable. Btw, Im repeating myself that most of your “fast” results, not waiting for science, are rubbish. Think again of that sun-earth example: Obviously people had hundreads of years to get to a “faster” result and were all wrong – because they didnt use science. So fast and not scientific often simply equals false. Jim, in this article: http://journals.humankinetics.com/jab-back-issues/jabvolume10issue1february/emgforceandpoweranalysisofsprintspecificstrengthexercises it was shown that out of sprinting, bounding, stepping, and hopping, bounding provided the greatest propulsive forces, sprinting the greatest power outputs, hopping the greatest braking and vertical forces. Bounding actually has similar vertical forces compared to sprinting. This shows that we can justify the inclusion of eah of these drills based on their superiority in one aspect or another and potential to overload the neuromusculotendinous system. Bret, I did not mean to imply that bounding was a inferior method of training or drill only that we do not want to produce excessive vertical forces when actually sprinting. If one were to bound down a track during a 100m event they would be left in the dust simply because they are spending too much time in the air. Exactly Jim! There are quotes from Ralph Mann and from Joseph Hunter (two great sprint researchers) in the literature saying something like, “a sprinter should produce just enough vertical force to lift the body sufficiently high to allow the athlete time to cycle his legs back around, and all additional energy should be directed at maximizing horizontal force to propel the sprinter forward down the track.” This isn’t a direct quote…I’m too lazy to track down the actual quotes, but essentially that’s what they were saying. Hi Brett, thanks for the direct reply, it looked like personal best time over 100m was used to distinguish elite from sub-elite in the abstract as you stated, but was just seeking clarification that this was the sole criteria? Apologies for any confusion. 0.11 seconds difference in personal best over 100m when looking at mainly the acceleration phase seemed a bit of an arbitrary separation for elite and sub-elite? Maybe justification is discussed further in the paper? Or was this cut-off selected post-hoc for convenience and displaying a certain result? Thats very cool, thank you. Not a question, but a comment, I think a lot of people here are getting caught up in the training implications of this “new” finding. How do we change our gym work/ what exercises do we use to better apply the force on the track etc. Generally as a sprints coach, you don’t. The direction of force application is and always has been a function of technique in my massively humble opinion. Now to write a paper that somehow proves that…. Great interview.. Thought you guys would be interested in a paper involving a 60m sprint measured with a row of force plates surrounded by 60 cameras. Nagahara et al, 2014, “Kinematics of transition during human accelerated sprinting”, Biology Open. Yep, got that one Leland. Thanks for thinking of this, it’s a great article! Thank you for the article, very interesting and thought provoking. This study was focused on acceleration and the importance of being able to better orient force production in the horizontal direction. Does anyone have any insights/opinions on how to better improve top end speed sprinting in terms of training exercises and methods? (i.e overspeed training). Furthermore do you think that using the weight sled for top end speed would be beneficial to top end speed? We need more training studies examining the effects of certain methods on sprint speed. One could make a case for flying sprints, bounding, hopping, overspeed sprinting, sled work, hamstring exercises, end-range hip extension glute exercises, plyos, explosive lifts, squats, and more. Awesome interview! 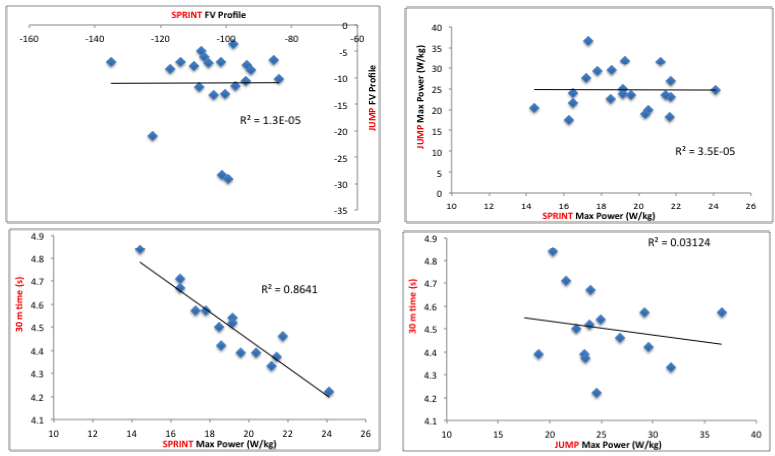 What is “sprint power?” The graph about the Rugby players is fascinating but what is sprint power? Did I miss it somehow? Eric, it’s horizontal force times velocity (power equals force times velocity). Fantastic interview – thanks Brat! The finishing words with recommended increased training with a focus on horizontal force more than on the vertical. Here is mentioned sled and uphill – sprinting. What about my idea of the Powersprint machine? Couldn’t it be good alternative as well? I think It is possible to get very close to correct sprint muscle work during the whole acceleration. Of course the posterier chain here of Central Importance, but also adductor magnus. You can focus of the correct movement and also with heavy loads. Yes Jan, I think that your machine appears very well-suited for this purpose, but of course before being confident I would need to test the machine out and verify that it “feels right.” And then the next step would be to compare EMG activity with your machine to sprinting, and then finally to conduct a training study to ensure that theories match experiments. So much work is required to be confident in something! Learned a lot from reading this! All this time I had been thinking vertical forces were more important for all aspects of the 100m because I must have read it on some blog but it makes more sense that horizontal GRFs are more important. I wonder how training mostly vertical GRFs in the gym affects ones GRFs on the force plate. Does a sprint-trainee who does squats and deadlifts have a lower ratio of horizontal to vertical GRFs compared to someone who trains hip thrusts and sled pushes/pulls only? I have a biomechanics question now. Wouldn’t uphill sprinting train vertical GRFs more and horizontal less? I would think a slight downhill sprint would show a higher horizontal to vertical GRF ratio than uphill. Now that’s a study I also want to see. and some studies indicate that very large increases in squat strength over a period of several years seems to lead to rather small increases in speed (http://www.ncbi.nlm.nih.gov/pubmed/23238095). The problem is, we don’t have much research on other exercises – squats are the most well-researched exercise in terms of transference to sprinting speed. Other exercises such as power cleans, RDLs, hip thrusts, sled pushing, kb swings, and NHCs might be more effective at increasing sprinting speed, but we need much more research to show this. And it’s important to note that in order to maximize sprinting speed, one needs to mind the high velocity side of the FV curve more so than the high force side (hopefully that makes sense). Ian, in the speed-dynamics philosophy, drills are directed at specifically targeting the 2-4 seconds of sustainable maximal velocity. To improve this you have to target this very short phase in your drills typically called ins and outs or fly in sprints. For example, accelerating and gradually increasing speed while gradually inhaling air from a fly zone of about 15-25m. You need to unhale to get enough air to increase spine stability. This will allow an increase of force. After 15-25m a short action zone of about 10m is reached whereby you hold your breath and then attempt to attain maximal velocity in small segments of 10m followed by submaximal segments of 20m. The amount of different segments depends on the experience of the performer. This type of drill is specifically designed to train the maximal velocity phase only(which cannot be maintained long) hence the very short maximal sections followed by submaximal sections. In addition, fast bounds with very quick forward steps and short ground amortization times have been found to highly correlate with top end speed. High powered jumps with longer amortization times will build acceleration. I like this idea Will, and I think that flying sprints and various bounding, hopping, and plyometric drills are worthwhile in training for the purpose of increasing maximum speed. Some other thoughts…studies indicate that stiffness or rapid vertical force production, such as that which is seen during the drop jump, is highly correlated with maximum speed (http://www.ncbi.nlm.nih.gov/pubmed/19826298), but with regards to acceleration, the broad jump is more correlated than the vertical jump, at least when looking at 1,136 NFL combine candidates (http://www.ncbi.nlm.nih.gov/pubmed/22201696, http://www.ncbi.nlm.nih.gov/pubmed/22240551). So a variety of vertical and horizontal plyometrics are valuable in increasing sprint performance, but I think that for maximum speed, we can’t neglect the importance of the hamstrings. Yes Bret, I agree precisely, I was referring to horizontal jumps(sorry should have specified this) Drop jumps and depth jumps also can be performed with a vertical or horizontal execution. Likewise, bounding and broad jumps(which u know I love) all should be useful here. Plus lots of reverse hypers, hyperextension, hip thrusts, backward sled drags etc. I only was referring to the drills that focus on speed and explosive strength. A hefty dose of special exercises is of course essential to make the hamstrings and flutes super strong. Bret, it seems that in distilling this great interview and your comments, the body’s forward lean is critical in the horizontal/vertical force generation debate. That’s why the horizontal forces are so effective during the acceleration period–right? And it follows that training with a sled (forward lean) and uphill work (forward lean) improve sprinting speed. So it’s not so much a “pawing” motion as it is a push-off while leaning? Again, it follows that broad jumping would be more appropriate than vertical jumping. When referring to “horizontal force” is this correlated with a foot strike and “pull” or a horizontal push as the foot strikes under/behind the runners COM (similar to a sprinter pushing into blocks at the start of a 100m race)? Not sure if i missed the definition of what the horizontal force is referring to biomechanically. Dan, great question. When the foot touches down, since the body is moving forward and the leg is out in front of the COM, there’s a horizontal braking force (horizontal negative). After the sprinter’s COM passes over the foot, now horizontal propulsive force (horizontal positive) is produced. The hamstrings are working via knee flexion to pull the COM over the foot and then via hip extension to push the COM forward. Of course other muscles are at play too, but the hamstrings are the most interesting IMO. Exactly this muscle work can be performed in the powersprint® machine, which definitely can not be compared with a step-up machine that many alleged. The machine, which has evolved gradually over decades is a simple but carefully tested solution for the one-leg lifting as a more specific strength training and as an alternative to eg deadlift and powerclean. You can use a variety of individual technicians as well. Are you a more “quadriceps oriented” sprinter or a more “hip-oriented”? – You could excellent train with your personal “sprint sensation”. Of course you also should use all of the previous exercise modalities for variation. Powersprint is just another help for develop basic capacity to be able produce the enormous horizontal forces, required for for elite sprint times today. Bret, don’t want to bang on about this buy do you know what dropping height was used in the experiment you related? To simplify: During acceleration, horizontal forces must be high to overcome inertia quickly. At any speed steady state, inertia is zero, so horizontal force must be equivalent to internal and external friction (air resistance, etc.). Since elite sprinters spend about 75 percent of the time in the air at full speed, the upwards vertical acceleration must be large during the 25 percent of time in ground contact to ensure the runner finishes at the elevation they started. In alot of these studies do they adjust for bodyweight in relation to correlationen? Example: Vertical jump in relation to Sprint speed. And if they do, did anyone look into if the relationship is linear? I don’t agree that sled pulls or uphill running are effective tools for improving horizontal forces, in that they tend to alter sprint mechanics and therefore muscle recruitment sequencing and contribution and force vectors. In both cases forward lean tends to be initiated by the athlete from an overly exaggerated torso lean, where as a more upright posture and forward lean of the shin angles would create a stance phase closer to the CoM and a better transition of forces contributing to more efficient horizontal acceleration. Slower athletes tend to be disadvantaged in relation to posture which transfers into poor biomechnics and theerfore sprint mechanics, with the tendency to over-stride, which contributes to increased breaking forces. Of course there are other contributing factors that effect speed, but the initial differences between a natural sprinter and someone who has to work at it, seems to me at least, to derive from individual biomechanical advantages or disadvantages. When you ask most people who have poor biomechanics and in-turn poor sprint mechanics to increase speed, they try to create a longer stride length by increasing front side mechanics, by overreaching with their lower leg. This in-turn changes the angle of the shin and increases the distance away from the CoM between foot contact and the hips, and hence the CoM, during the stance phase, increasing breaking forces and decreasing horizontal acceleration. Body weight, power to weight ratio’s, cadence and FT muscle fibre ratio’s aside, postural biomechanical differences and hence sprint mechanics are a major contributing factor to horizontal force production and speed. This may, in top level athletes, only manifest in slight differences in hip tilt, shin angles and distances between ground contact and CoM, but will contribute significantly to overall vertical to horizontal force ratio’s, GRF and slight differences in swing phase speeds, and thus total stride length over the 100m and 200m distances. Most effective sprinters will lead with the knee and not over reach with the lower leg, like lesser athletes tend to do in order to create a bigger stride length. Simply leading with the knee when sprinting closes the lower leg and changes the angle of the shin, bringing it closer to the CoM as the foot contacts with the ground, enabling a more efficient transition of force into horizontal acceleration as well as reducing braking forces. Incorporating things like drop jumps/depth jumps, double leg bounding, single leg speed hops over distance, alternating speed bounding(this helps to reduce an over emphasised vertical force production and naturally increase horizontal emphasis), and a simple coaching cue of leading with knee and not to reach with the lower leg, are all effective methods for increasing muscle and tendon stiffness, force coupling transition times between eccentric/concentric contractions and effective mechanics for transitioning effective horizontal force production. For general strength I would include squats for the vertical component and KB swings for the horizontal component. This is of course in my humble opinion and observations. I’m really just an ageing athlete, with much of what I have expressed based on my anecdotal observations. I could of course be wrong in everything that I have said. I don’t know.